Well, we can’t say we planned on it, but GRFT is now tradable on TradeOgre exchange. Our focus exchange-wise has been on getting a higher tier exchange that can be a solid part of the GRAFT eco-system for in-network exchanges; however, since GRAFT is a public, decentralized blockchain, if a new exchange that needs to gain some traction in the market decides to list it, there’s little that we can do to stop them. 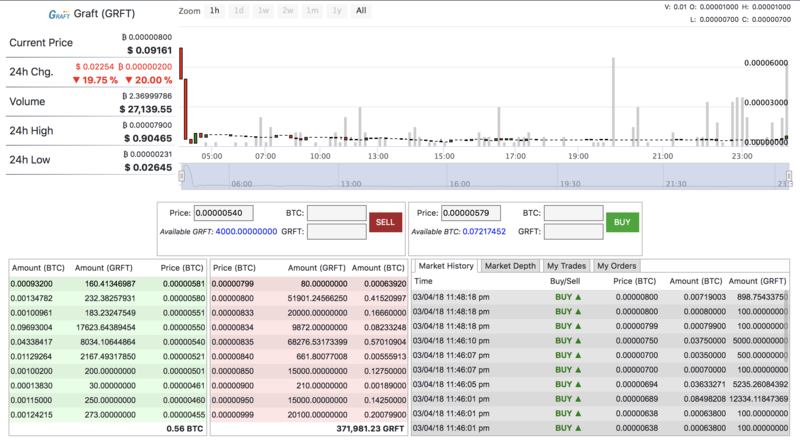 This is what happened with TradeOgre* – they have unilaterally decided to list GRFT, so we woke up to the fact that GRFT was tradeable. While it came as a surprise, the fact that GRFT is now tradeable allows people who were in for a quick turnaround to get out quickly. We don’t see and never positioned GRAFT as a “turn a quick profit story” so we’re relieved to see the balance shift back to the folks who appreciate GRAFT for its long-term potential. *TradeOgre is a new budding exchange with little real history, so if you decide to trade, please do so at your own risk.